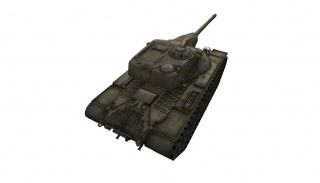 The T54E1 is an American tier 9 medium tank. Although a pretty challenging vehicle to play due to its huge size, sluggish speed, weak armor, and poor gun handling, the T54E1 is made an effective tank by the power of its autoloading guns. 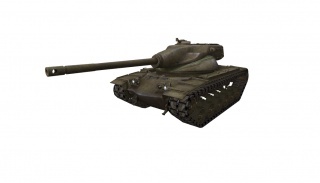 The T54E1 is able to bring focused damage to a firefight and is not crippled by a long reload time like many other autoloading tanks. The T54E1 is capable of devastating an enemy force at the opening of hostilities, withdrawing, and then sweeping back in shortly after with a fresh clip to crush the remaining resistance. Effective timing and good support tactics allow a T54E1 driver to achieve victory. The T54E1 leads to the T57 Heavy Tank. Poor gun handling in dispersion and aimed accuracy. Fires faster than it can aim. Large size with poor armor and crew protection; frontal half section of hull is made out of pure ammo racks. Rather painful stock grind and can be extremely underwhelming in tier 10. You can carry a total of 36 rounds with the 105mm gun, in clips of four. The reload time between each round is 2.22 seconds with a 35 second drum reload, which is fast enough to not completely remove the tank from participation after the first burst during a heated firefight. 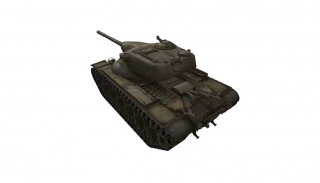 The vehicle lacks HE rounds with top gun, limiting you to AP and APCR, which can be troublesome for damaging or de-tracking certain heavy targets. The penetration is 255mm for the APCR, which is roughly workable, being only on par with some if not most other meds' regular rounds. In addition, the aim time and accuracy are sadly terrible, both being 2nd worst in tier. Yet with 4 shots of 390 damage in check, you are still an effective second row tank, a flanking, lurking, spam-damage machine. Again though, just like the T69, you need to operate either well out of the field, out on a flank, or lurk with a couple of big boys. Never go it alone somewhere that a flanking medium or mobile heavy can pick you off. A Obj. 430U for example, will eat you for breakfast in a head-to-head. Sometimes you'll be heckled for not 'playing like a normal medium' - just ignore it - you're not a 'normal medium' at all. The significant height and size, coupled with 2nd-rated mobility will make your scouting or spearheading effort mostly suicidal! Play it like a pocket heavy tank due to its synergetic effect with other brawlers. One thing that you might consider, if you have some pals with the same tank, is to mass-platoon three of them and stagger-fire, covering each other on the magazine reloads. The amount of metal coming out of a platoon of three that works closely together is insane. Arty will be all over you like a rash though, so keep mobile, use that agility well and listen to that sweet sound of three 105mm cannons firing in rapid succession. The AN/GRC-7 radio carries over from the T71 (not the T69) and should be installed immediately. The Continental AV-1790-3 engine carries over from the T29 if you played it previously. The Continental AV-1790-5B engine can be used if the M103 is unlocked. The AN/GRC-7 radio transfers over if you have the M103 elited. You'll need the upgraded suspension before mounting the top gun. However, this can be avoided by installing the enhanced suspension module. 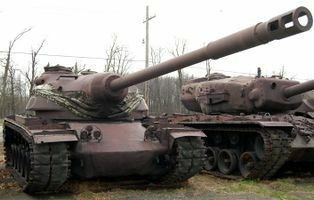 The T54 was a series of prototype American tanks of the 1950s with three different turrets, all armed with a 105mm gun, mounted on the M48 Patton chassis. 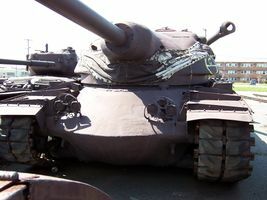 The original T54 had a conventional turret with an autoloader, while the turret on T54E1 was of an oscillating design with an autoloader and the one on T54E2 was conventional with a human loader. 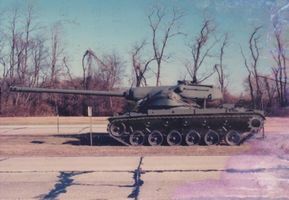 The turret on T54E1 was similar to that of the T69 in its oscillating design and in that it held a crew of three and a nine-round drum autoloader under the gun. 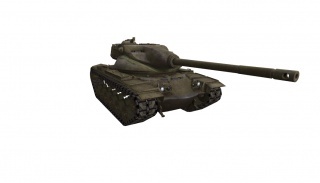 The T54E1 was abandoned in 1956 and in 1957 the entire project was cancelled in favor of the T95 medium tank. This page was last modified on 9 October 2018, at 16:38. This page has been accessed 323,965 times.